Many sincere thanks to Lagunitas Brewing Company for donating this beautiful space for our event. 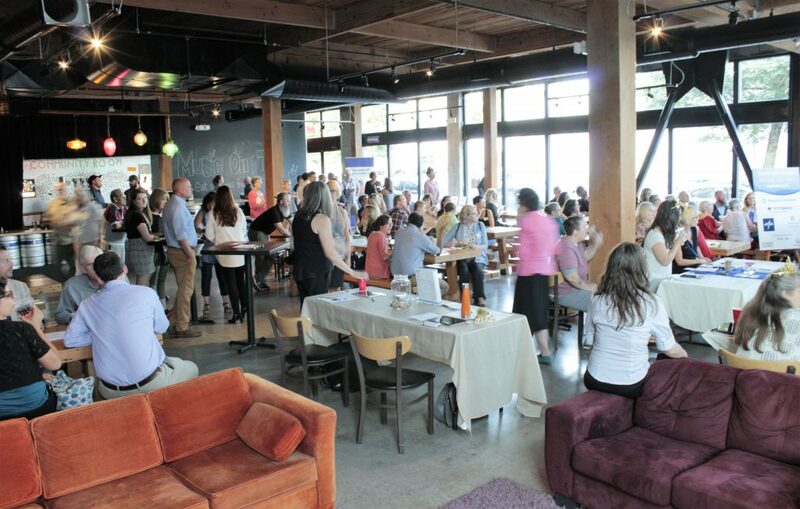 Last Thursday evening, over 90 people gathered at the Lagunitas Community Room in Northeast Portland to celebrate the incredible benefits that music can have for people with serious and chronic illness, and to raise funds to support the Housecall Providers Bringing Music Home program. 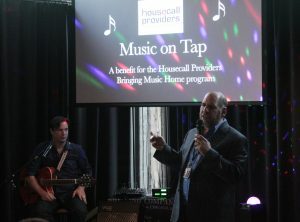 Volunteer Coordinator, Todd Lawrence, tells stories about individuals served by the Bringing Music Home program, while musician David Lane prepares to perform a patient’s favorite song. 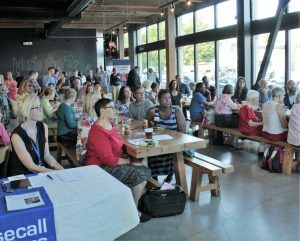 Through a program that wove heartfelt storytelling with live music performed by local musician, David Lane, guests learned about how volunteers are using personalized playlists to soothe pain, relieve loneliness, and help restore a sense of identity for people living with chronic and debilitating illnesses like Alzheimer’s Disease. Several Bringing Music Home volunteers enjoy food and drinks during the event. We are so grateful to everyone who came out to hear stories about, and songs loved by, the participants from the first two years of the Bringing Music Home program. With your help, we’ve raised over $7,000 from 42 different donors to help people living with chronic illness and disabilities have a better quality of life through the transcendent power of music. 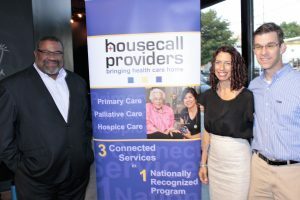 CareOregon CEO, Eric Hunter stands with Housecall Providers CEO, Rebecca Ramsay MPH, BSN, and Advanced Illness and Hospice Medical Director Dr. Will Kennedy. 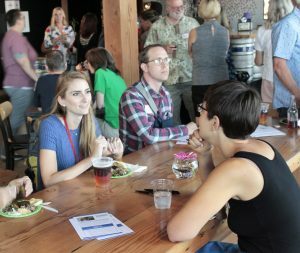 Thank you to the many wonderful volunteers who helped make this event possible, and to Lagunitas Brewing Company, 2 Towns Ciderhouse, McMenamins, K & M Wines, JC Provost and Leslie Conner for their in-kind donations.